No helmets in your lap–they restrict movement of the yoke. Don’t touch any aircraft controls at any time. Stay low when climbing into and out of the cockpit. Don’t lean on the yoke. If your helmet’s on your head, remember to duck lower when getting in or out of the cockpit to avoid ceiling-mounted controls. When seated in the right seat, be aware of the prop overspeed switch by your left knee and don’t touch that either. Rolling down the window is fine, but put it back up before you exit. Feel free to talk to the pilot, but remember that the radio takes precedence–don’t distract the pilot when he’s talking to air traffic control or manifest. In case of emergency, buckle in unless the pilot instructs you to exit. Whenever possible, put a smaller skydiver in the right seat (less chance of touching things they shouldn’t). Move out of the cockpit into the back before jump run, so you’re not distracting the pilot on jump run. 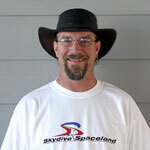 Rabbitt is a skydiver as well as Skydive Spaceland's chief pilot, USPA Safety and Training Advisor. He is a commercial pilot, holds U.S. National gold and silver medals in formation skydiving, was a participant in a 297-person formation, and was a videographer in world record attempts.